I’ve been so busy in the garden and with work that I haven’t had much time for garden-related reading, but four new books worth mentioning recently came my way. Two of them are part of a series of regional gardening books put out by Lone Pine Publishing, a Washington-based publisher of gardening and how-to books. Herb Gardening for the Midwest, by Debra Knapke and Laura Peters, is an herb-by-herb guide to growing and using herbs from basics like basil and parsley to the unusual. Has anyone heard of orach? According the Knapke and Peters, it tastes like a mild spinach and can be used to treat sore throats and jaundice. If you are interested in herb gardening, this would be a good, basic book to buy. It’s a soft cover and costs $19.95. Container Gardening for the Midwest by William Aldrich and Don Williamson, with Alison Beck and Laura Peters, follows a similar format to the herb book. It opens with an introduction to the basics of container design and upkeep, then goes plant-by-plant through a selection of annuals, perennials, shrubs and trees that can be grown in containers, everything from arborvitae to yucca plant. I like that Williamson, who Minnesotans may know as co-author of several books on gardening in Minnesota with Northern Gardener columnist Don Engebretson, and company do not restrict their plant choices to the usual suspects. For instance, they recommend growing blueberries in a container, which makes a lot of sense since blueberries require soil much more acid than Midwestern gardens usually have–so why not manage the soil better in a container? Also, soft cover, $19.95. British publisher Cico Books recently released Quick and Easy Container Gardening by Tessa Evelegh. The book includes step-by-step instructions for 20 container projects. This is more of a “pretty picture” book and the photographs by Debbie Patterson are beautiful. The book also leans toward gardening as decorating, so if you want an idea for using containers for dinner party decorations or finding cool containers at junk stores, this is the book to check out. Again, soft cover and $19.95. The last book is probably my favorite of the lot, but it’s not out yet. I received an uncorrected proof of Rodale Press’ new Best-Ever Backyard Birding Tips, by Deborah L. Martin. This is 300-plus pages of advice on how to create a bird-haven in your backyard, with information on everything from providing cover to growing the plants birds love. It includes profiles of individual birds, including those most commonly seen in Minnesota. 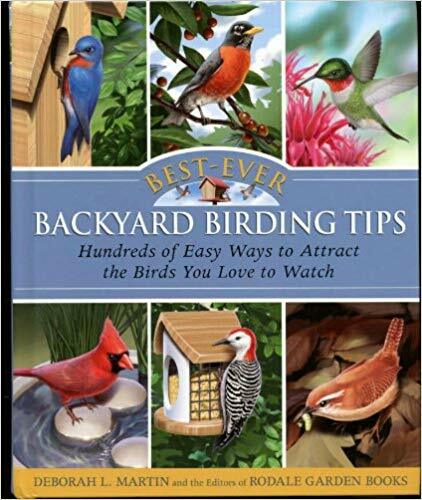 The book has several nice features, including tips for attracting birds on a budget and “myth-busters” that address common misperceptions about birds. For instance, their feet will not get stuck on a metal perch in cold weather a la Ralphie’s friend Flick’s tongue in the best Christmas movie ever made, A Christmas Story. Best-Ever Backyard Birding Tips will be released in late July, and speaking of the holiday season, it would make a great gift for any birders or bird-loving gardeners on your list. Back when I first tried to grow blueberries, before the heartbreak of having my blueberry bushes repeatedly fall victim to a heedless lawnmower (the human variety operating the mechanical variety), I asked whether I could just keep them in pots for the very reason you suggest. I was told no, because they’d freeze too hard. I’d be interested to hear what the container gardening book recommends during the winter. The book in question was written by an author based in London, and as you know, British weather is distinctly different from ours. I haven’t tried the pot thing–having dealt with the heartbreak of blueberries dying without any human or mechanical intervention by just plain giving up–but I think if you could get the pot in a garage or other protected area, they might survive the winter. I haven’t tried it, but maybe some other readers have and will weigh in on the conversation. Penny: I did a little checking around and found a site with information on growing blueberries in containers. It can be done!